Yes, it’s Dixie and LOIS, not Dixie and Louis. Several weeks ago, we found that we had misnamed Lois – – she began laying eggs. For a while, each morning we found two eggs in the duck house when we went out to open up for the day. Duck eggs are not all that different from chicken eggs, except that they seem to be better for baking pastries, etc. Sadly, we find only one egg in the duck house now because Lois was killed by a raccoon a few nights ago. There was a disturbance about 01:30 in the morning, and we found Lois had been dragged to a spot under the sycamore tree. I immediately prepared a grave near a lemon tree, and buried her there. We have now made the duck house more secure. Poor Dixie. She and Lois had been constant companions since hatching, and she is obviously very disturbed by this sudden turn of events. She spends a great deal of time frantically calling for Lois with extraordinarily loud “duck calls” – sounds she had never made before. I spend all the time I can with her now, and she calms down when she knows I am nearby, in the back yard. We have found a breeder in a nearby town who says he can provide a Cayuga hen about the same age as Dixie, and I hope to pick up this new companion for Dixie within the next couple of days. 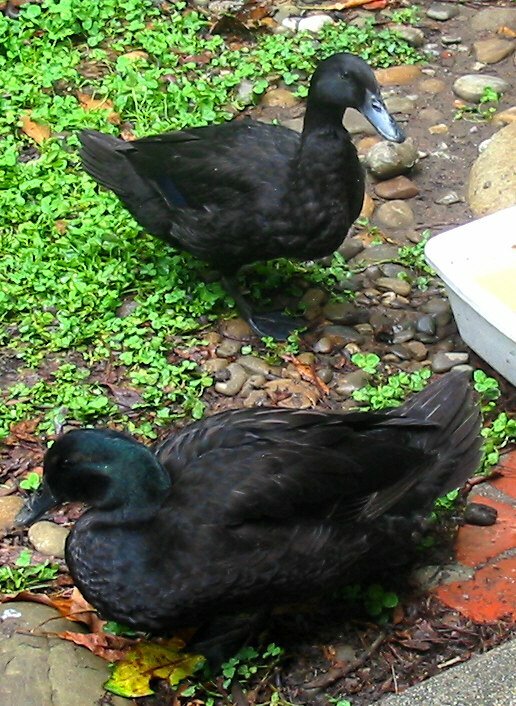 This entry was posted in ducks and tagged cayuga ducks, ducks, Pets. Bookmark the permalink.